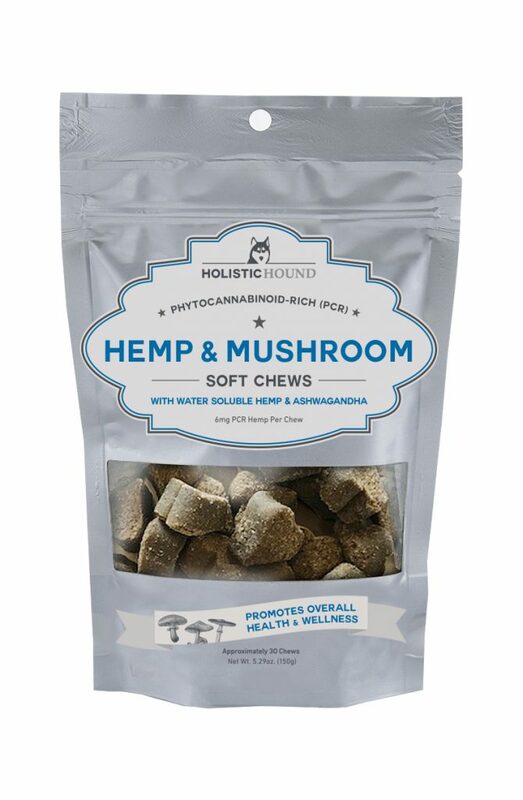 Holistic Hound will introduce a new Soft Chew version of their acclaimed full spectrum hemp and mushroom supplements with CBD, to debut in March at independent retailers nationwide. The Soft Chews will provide a new option appropriate for both dogs and cats, and feature water soluble hemp oil and ashwagandha extract for additional health benefits. “We are thrilled to add Soft Chews to our popular line of supplements, giving pet owners a new option to naturally treat a variety of conditions and support the health and wellness of their animal companions,” said Holistic Hound founder and homeopath Heidi Hill. “In addition to the many attributes of our existing products, the Soft Chews will feature water soluble hemp oil, significantly increasing absorption and bio-availability, as well as ashwagandha, a beneficial herb used in India for centuries to promote calmness, hormone balance, immunity, joint health and more. Holistic Hound Soft Chews contain 6 mg of CBD per chew, with beef broth and beef liver for superior palatability. A package of 30 chews will be available for a MSRP of $45.00. Holistic Hound veterinarian formulated Soft Chew supplements are made with full spectrum, water soluble organic hemp oil that contains CBD and other minor cannabinoids, terpenes, flavonoids, fatty acids and other beneficial constituents — all working together to support pets’ health, wellness and vitality. Water solubility results in a greatly increased rate of absorption and effectiveness for optimal results, on a full or empty stomach. Reported benefits include reduced inflammation, calming, antioxidant, maintaining a healthy intestinal tract, enhanced physical and mental well-being, and more. Holistic Hound’s Soft Chews also contain KSM-66 Ashwagandha, a highly concentrated, full spectrum ashwagandha root extract, drawn using only the roots of the plant and produced using the first-of-its-kind extraction process based on the “Green Chemistry” principles, free from alcohol or other chemical solvents. An adaptogenic (promotes balance in the body) herb used in India for centuries, studies in animals show that ashwagandha can promote calmness, muscle function, hormone balance and immunity, improve joint health, lower anxiety levels, and more.